It turns out, that instead of charging me for the combo and not giving me the drink that is included in the combo, the cashier charged me for two pieces of chicken and a side dish only, which comes out MORE than the combo. They would not give me a combo without the drink. It was as if I was asking for birthday cake without frosting. It just did not compute. After the cashier reminded me, “I told you, it’s more expensive without the drink” (which incidentally, she did NOT tell me) I paused for a moment. Finally, I tentatively suggested, “how about a cup of ice with some tap water in it?” “Yes, we can give you water.” Aha! A solution! The new total? $5.30. And that’s how a cup of water saved me 41 cents – almost enough to buy a First Class stamp. The above picture is the magical cost-saving cup of H2O. Hilarious! 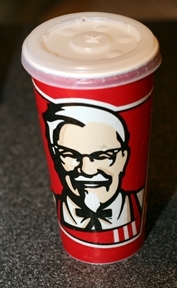 Most fast food joints will replace your soda with bottled water, but then you miss out on the KFC Cup.